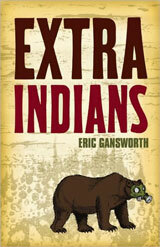 Extra Indians by Eric Gansworth, is a jumble of characters and their stories. Ranging from a lost Japanese tourist in search of the buried treasure mentioned in the movie Fargo to Frank, a struggling Native actor and the legacy he leaves his son, Gansworth fills his fourth novel with memorable characters. Vietnam, life on the Rez, and Dear John letters fill in all the blanks. Worth the effort it may take the casual reader to get to the conclusion.
. Due to the push-n-pull nature of the story I can only give it a 5 out of 10.